On paper Beyond the Gates sounded awesome, basically it sounded like the plot of Jumanji but applied to horror rather than adventure. 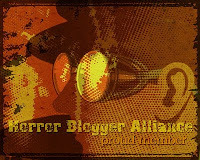 This has been made as a homage to 80's straight to video horrors and in that respect it hits quite a lot of the marks, however for me I felt it took slightly too long to get going and that not enough was explored with the core idea. I love Jumanji and so was excited for this, but the game only really features in half the movie, the trio don't even start playing it until 45 minutes has passed. Before this point there is plenty of character building, albeit in a cheesy 80's style. I liked the character development between the two brothers who are polar opposites of each other. Gordon is serious and smartly dressed, while John has become a bit of a rebel character. With the horror though there really isn't much at all until after the halfway mark. I thought Crampton was great as the host and created some surreal moments, but aside from her all the horror that occurs in the first half is a few nightmare sequences, and a few items moving of their own accord. I had heard this was quite a bloody film so when this made an appearance it was pretty cool, and indeed bloody. The aim of the board game is to collect four keys, and these manifest in the real world in threatening ways, such as in a voodoo doll, and in the head of a possessed character. The blood is very over the top and fun to see, I especially liked one shot where blood spurts out a body straight into the face of a nearby character who starts screaming. Aside from the last of the keys the actual deeds the heroes have to face are not exactly that fearsome, I expected real hardships and terror but instead it is all dealt with a little too neatly that felt a bit of a shame. It leads up to the gang going the titular beyond the gates, but this sequence is let down by a sparse looking set full of smoke that does replicate the feel of 80's low budget horrors, but I kind of wish it hadn't. For me the pacing felt a little bit off, I feel the actual playing of the board game should have been the main focus rather than the build up to the discovery of its evil powers. At least the soundtrack was great though, the usual retro synth music that so well conjures up the feeling of the 80's when it comes to the horror genre. Again I realise it was aping the feel of that time period but the characters all felt pretty under developed, particularly Margot whose defining feature seemed to be that she sleepwalks when she is on Ambien. The mysterious antiques shopkeeper character felt like he was straight out of Needful Things but due to this similarity his weird performance felt more like an act, rather than an original spin. 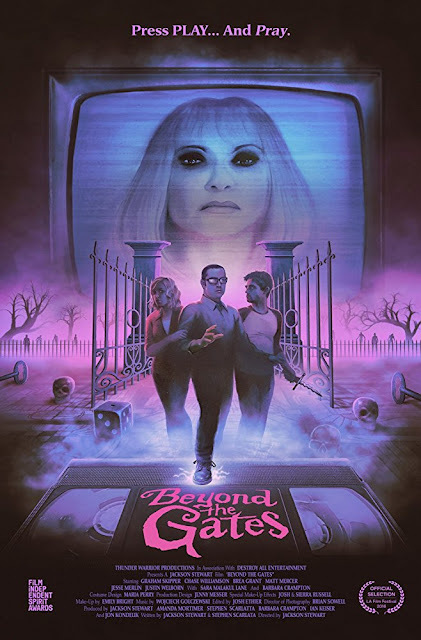 Beyond the Gates is successful at making itself feel like a lost classic from the eighties, however it does so to its own detriment at times. I loved the gory special effects when they finally arrive but couldn't help that the build up was stretched out longer than it needed to be. Beyond the Gates is currently streaming exclusively on Shudder.